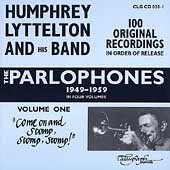 I knew I could’t blog for long without writing something about a great hero of mine, the inimitable Humphrey Lyttelton, better known to his many fans as “Humph”. He died earlier this year (on April 25 2008, at the age of 86) of complications following a heart operation. News of his death came as a massive shock to me, as it had never really occured to me that one day he would be no more. Tributes to him in the media were unsurprisingly glowing in their admiration. In later years, Humph was best known as the chairman of the long-running radio comedy show I’m Sorry I Haven’t a Clue, subtitled “The Antidote to Panel Games” in which his gravelly but perfectly elocuted voice, schoolmasterish manner and impeccable comic timing proved the perfect foil to the antics of Barry Cryer, Tim Brooke-Taylor, Graeme Garden and many other contributors. I hope I get the chance to say a bit more about this programme in due course, as I treasure my collection of recordings of shows that still make me laugh at the umpteenth listening. But Humph had many other strings to his bow. He was a talented cartoonist and a gifted writer, and also hosted the BBC Radio programme “The Best of Jazz” on Radio 2 for forty years, counting the great John Peel among his legions of listeners. I owe a special debt to Humph for this programme as I listened to it religiously every monday night at 9pm during my teenage years. He would open the show with “This his Humphrey Lyttelton here, with the best part of an hour of jazz between now and five to ten”. His theme tune then was Wanderlust, recorded by a subset of Duke Ellington’s orchestra with the great saxophonist Coleman Hawkins appearing as a guest and contributing a truly magnificent tenor solo near the end of the piece. Through Humph I discovered most of the music I still listen to on a daily basis, jazz from the classic era of Louis Armstrong and Jelly Roll Morton, through the swing era of Duke Ellington, Benny Goodman and Count Basie, the postwar bebop period of Charlie Parker, Dizzy Gillespie and Thelonious Monk, Miles Davis and John Coltrane, then modernists like Ornette Coleman, Sam Rivers, Archie Shepp and onto the avant-garde of the time. Humph loved all kinds of jazz, and he communicated his encyclopedic knowledge a style flavoured by a dry sense of humour. I never met him in person, but I would have loved the chance to thank him for helping nurture in me a passion for all that wonderful music. 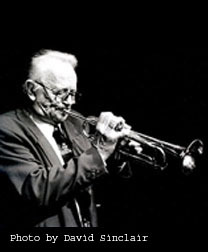 Humph was also a fine Jazz trumpeter and bandleader in his own right. When my father was at school in the 1950s, the Lyttelton band was the leading “traditional Jazz” band in Britain. Humph had played with many of the greats, including Louis Armstrong and Sidney Bechet, and won their admiration for his trumpet-playing. My dad had become a Lyttelton fan at School and it was this that persuaded him to take up playing the drums. He joined the RAF for his national service, and he had the opportunity to play with various bands then and later on when he went back into civvy street. He was a life long admirer of Humph and eventually got to play with him at the Corner House in Newcastle but not until the 1990s. He told me it was one of the proudest moments of his life, although he had been so nervous he didn’t really play very well. I have a photograph of this occasion somewhere, but I can’t find it for the moment. I’ll add it when I can get it scanned. 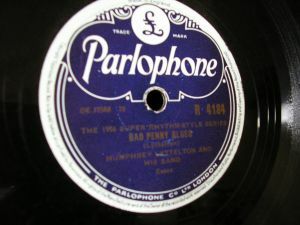 In the late 1940s Humph’s band had started to record a series of 78rpm records for the Parlophone label, starting with a lovely version of “Maple Leaf Rag” and stretching to over a hundred titles. Among these tracks was one record that actually made it into the Top 20 of the British pop charts in 1956, admittedly at Number 19, but nevertheless that’s no mean feat for a Jazz record. I should point out that this was long before my birth, but I remember hearing the track many times around the house when I was young. But the real key to the success of this record was a young man by the name of Joe Meek. Starting out as a sound engineer at the Parlophone studios, Meek had quickly established an excellent reputation and in this case he was asked to take over the whole production of the record. According to Humph, they were slightly concerned at what he was doing with the microphones before they made the take but after it was done they all went home and left Meek to do some tinkering with the sound before cutting the disk. In those days, recording techniques were relatively crude and there generally wasn’t much in the way of post production, especially in jazz. When he heard the final record, Humph was shocked. For one thing, Meek had close-miked all the instruments, including the drums – something which wasn’t generally done with jazz records for fear of (a) drowning out the rest of the band and (b) exposing the clumsiness of the drummer, the latter being a particularly problem. As Humph said, his band always sounded like the rhythm section was wearing diving boots. For this reason the drums were usually recorded with a distant mike and generally hidden in the ensemble playing. But in this case it worked out very well. Stan Greig used brushes on this track and his playing served beautifully both to propel and to punctuate the performances of the other musicians. But it wasn’t the drums that so disturbed Humph. Meek had also fiddled with the double bass and with the left hand boogie-woogie figures of Johnny Parker’s piano, fattening them out and changing the balance to bring them right up in the final mix. He also compressed the overall sound so that the bass lines seem to press in on both the piano’s right hand and the growling muted trumpet lead, tying them closer to Greig’s insistent drum patterns and creating an unusually dense sound. The result is an intense, driving feel, with a dark undertone that is quite unlike any other jazz record of its period and redolent with the atmosphere of a smoky jazz club. I love it, especially the moment when Humph’s trumpet takes over from the piano solo. With a timely kick from the drums and against the backdrop of those bluesy thumping bass lines the band finds another gear and they build up a fine head of steam before riffing their way into the fade. You can hear the original recording here, in a bizarre video I found on Youtube in which someone films their cassette player. I have an original 78 of this track but at the moment can’t transfer it to digital because I haven’t got a turntable, but when I do I’ll post it. Hopefully it will have better balance than the video. Humph didn’t like the way the record had been put together, but it was an instant hit. He later joked that he hated it all the way to the bank. Joe Meek went on to produce several classic pop records, generating many ideas that were later used by Phil Spector, but ultimately he became a tragic figure. Such commercial success as he achieved didn’t really last and he sank into debt, depression and paranoia. A gay man in an era in which homosexuality was still illegal, he became a victim of blackmail and was questioned by the police for alleged encounters with rent boys. He committed suicide in 1967 at the age of 37. And Humph went on to live another 52 years, bringing music and laughter to millions. To end with, here’s a link to a later version of the tune recorded by a more recent manifestation of Humph’s band, probably in the 1980s. Note the way his technique involved the use of his eyebrows! I may be wrong, but I think the pianist on this performance is Mick Pyne and the bass is played by Dave Green. I can’t really make out the drummer. 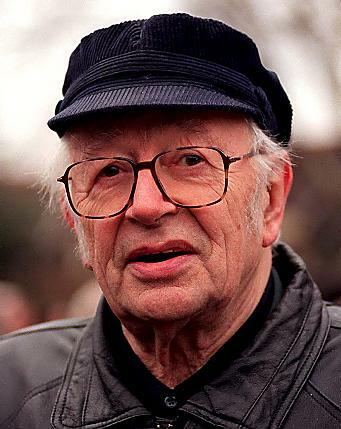 This entry was posted on October 1, 2008 at 12:08 pm and is filed under Jazz, Music with tags Humphrey Lyttelton, Jazz. You can follow any responses to this entry through the RSS 2.0 feed. You can leave a response, or trackback from your own site. Man, jazz really does reflect the struggle. I’d say I’m sorry, but that’s neither here nor there. I’ll just listen to those Bad Penny Blues. Humph was a great showman and a hilarious raconteur – he was also extremrly warm and generous when talking to us about Joe Meek. Humph, some time after Bad Penny actually asked Joe to produce another track for him – as a favor – not sure if it was meant for release or if it was just a private thing, but it is a goodie — I have to check what he gave us for the title. Our documentary, A LIFE IN THE DEATH OF JOE MEEK features Humph, whom we spoke to before a usual weekly performance in Barnes. The film is dedicated partly to him.